Complete with a year’s worth of devotions, the Kids’ Devotional Bible, NIrV will help children develop a habit they’ll want to keep. Engaging weekday devotions, fun weekend activities, interesting illustrations, and a dictionary make this a Bible they’ll want to read and apply to their lives. It includes the complete New International Reader’s Version (NIrV)—the stepping stone to the NIV—making it easier for young readers to read and understand. “Got It” feature that encourages kids to find answers to Bible trivia themselves. NIrV Kids' Devotional Bible by Zondervan is awesome! I love that this NIrV Kids' Devotional Bible includes short weekday devotions that help young readers apply Bible lessons for a full year. I also love that it has 52 weekend devotions that teach kids about God’s creation through fun activities like visiting the zoo and gazing at the stars because it helps kids remember that God made those things. The NIrV Kids' Devotional Bible also includes a “Got It” feature that encourages kids to find answers to Bible trivia themselves which is a great way to help kids learn about the Bible. The book introductions are awesome and I also like that it includes a dictionary so kids can look up words that they want to learn more about. 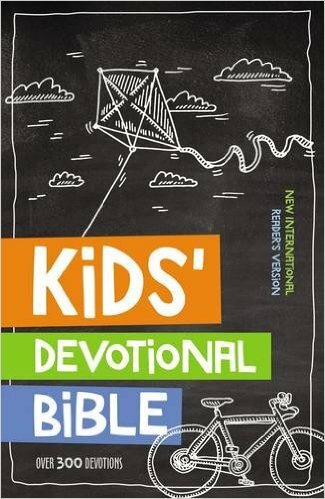 NIrV Kids' Devotional Bible is perfect for kids and uses shorter sentences and easier words so they can read it all on their own. You can find NIrV Kids' Devotional Bible by Zondervan on Amazon, Barnes and Noble and other bookstores.